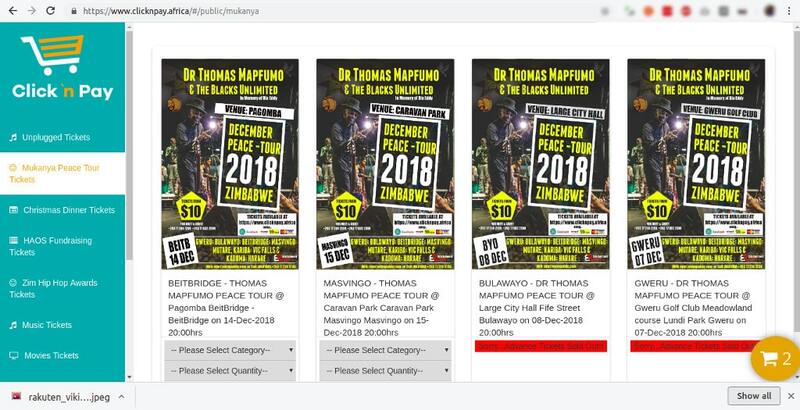 There is no doubt that when it comes to public opinion, Thomas Mapfumo cuts a controversial figure. Much of this has got nothing to do with his music which is still adored by a lot of fans despite his self-imposed exile which has seen him not releasing any new albums in recent years. Well it seems the “Lion Of Zimbabwe” has his heart now set on home. Ever since the self-styled “New Dispensation” came into power he has been making trips back to Zimbabwe with increasing frequency. Recently he announced several shows, The Peace Tour he calls them, such as the recent one he did in Gweru. Tonight he will be playing at Pagomba in BeitBridge from 20:00hrs. Tomorrow night he will play at Caravan Park in Masvingo again the show starts at 20:00hrs. Him conducting two back in two different towns is probably a show of stamina especially given his age. Anyway if you are his fan your may be wondering where can you get the tickets. Click n Pay is a startup that has simply flown beneath the radar. These guys have a website where you can buy tickets to most local events. It’s kinda of a local version of tickets.com but it is much more than that as you can buy a lot of other stuff besides tickets but that’s a story for another day. You can buy tickets to both weekend’s shows on the website. They accept Ecocash, Vpayments as well as Visa/MasterCard. Tickets to both the Masvingo and Beitbridge shows cost $20 for the standard ticket and $40 for VIP. The buying process is quite easy. All you have to do is select the type of tickets and quantity you want (1-5) and add to cart. During the check out process you can choose Ecocash and you will be send a USSD prompt to complete payment. You can also use the site to buy tickets to other events such as Stand Up Comedy with Alfred Kainga which is taking place on 21 December or Christmas Fundraising Dinner on the same date. Speaking of Christmas whatever happened to the Mayor’s Christmas cheer fund in partnership with Coca Cola? It is encouraging to see more and more musicians even those of Mapfumo’s calibre and age embrace local online solutions. Though I cannot give out figures, I have a feeling that the online eCommerce market has grown significantly in the past 12 months.